August’s slow news days are over, and news is popping off around the globe. Three big stories this week are worth careful reading. Oh, you don’t want to wade through pages and pages of links and analysis? Fine — I’ve done that, and have links to a bare minimum of articles with the inside stories of the assassination and aftermath in Libya, the Chicago teachers’ strike, and taxes in Minnesota. The anti-Islam movie that sparked anti-U.S. riots? It might not even exist. The 14-minute YouTube trailer is a mess, the actors were lied to, and references to Islam and the prophet were dubbed in over the actual dialogue. Eight things you need to know about the film, and the ultra-right-wing, anti-Muslim extremists who made it, from Poynter. The U.S. embassy in Egypt condemned the film BEFORE any riots or attacks began — because the film deserved condemnation. Then Mitt Romney condemned the embassy statement as President Obama apologizing for American values and scolded about making such statements as giving in to rioters. Hard to see how a statement made before the riots can be spun as a response to the riots, but that’s the way he played it. By the time you read this, the strike may be over, but the issues will remain. All sides agreed on one thing: this strike was not about money. It was about privatization, about charterization, about evaluating teachers based on student test scores, and about respect. Diane Ravitch blogs in the New York Review of Books about Two visions for Chicago’s schools and an excellent Reuters article summarizes the reform agenda and teachers’ resistance to it. 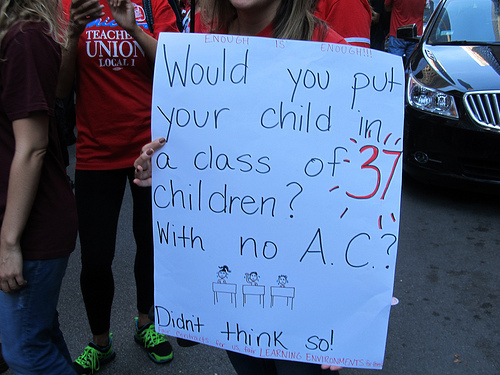 Chicago has been a leader in the current corporate reform movement, reports Democracy Now, and this strike marks one of the most serious challenges by teachers who are convinced that the reforms are bad for students. That issue isn’t limited to Chicago and isn’t going away even after the strike ends. Three pieces of tax news worth noting this week: Governor Mark Dayton’s tax speech, St. Paul’s school levy and Minneapolis’s school levy. [H]is administration is coming up with a plan to overhaul the entire tax code to make the tax system fairer to lower and middle income people. He didn’t offer specifics but said his plan would continue to include an income tax hike on the state’s top 2 percent of earners. Back to the barricades: it’s Dayton and the Democrats to raise taxes on the wealthiest vs. Republicans’ no new taxes pledge and their plan to cut taxes on “job creators.” Which side are you on? State taxes come from a rat’s nest of sources (sales, income, property, cigarette, gasoline, etc.) and get divvied up in myriad ways. Local school districts have just one tax to raise when they need more money, and that’s the local property tax. Sure, they get money from other sources, including state aid, but they have no control over that money. The legislature can cut the amount of aid that local schools get, and, as they did last session and the session before that, they can delay payment. School taxes are only one part of the complicated property tax bill, which also includes city and county and state and special district and special assessment portions. This November, voters in St. Paul will be asked to vote yes on increased school tax referendum levy. The amount in St. Paul is estimated at an average of $65 per house per year or about a 5.9 percent increase over last year. (In Minneapolis, the district is asking for a 7.4 percent increase, about $90 per house, but that would be a regular levy to be approved by the school board, not a referendum levy on the November ballot.) If you live in St. Paul and want to know more about the referendum, take a look at the FAQs on the district site. [Photo by Zol87, published under Creative Commons license.